Seven Layer Bean Dip - Chillin' out in WA - Have an Ultralicious day! Skip dinner and go straight for the dip! 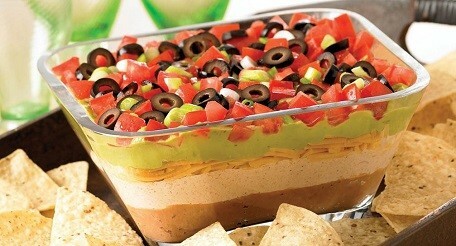 Seven layer bean dip is made by layering some of the tastiest Mexican foods into one yummy dip! Grab a bag of Rositas Corn Chips and get ready to snack! This blend of Goya brand refried black beans, Ultralicious Chilli Mix, Embasa Green Chiles, Herdez Salsa Ranchera, and Grated Aussie Jack Cheese will leave you wanting more.